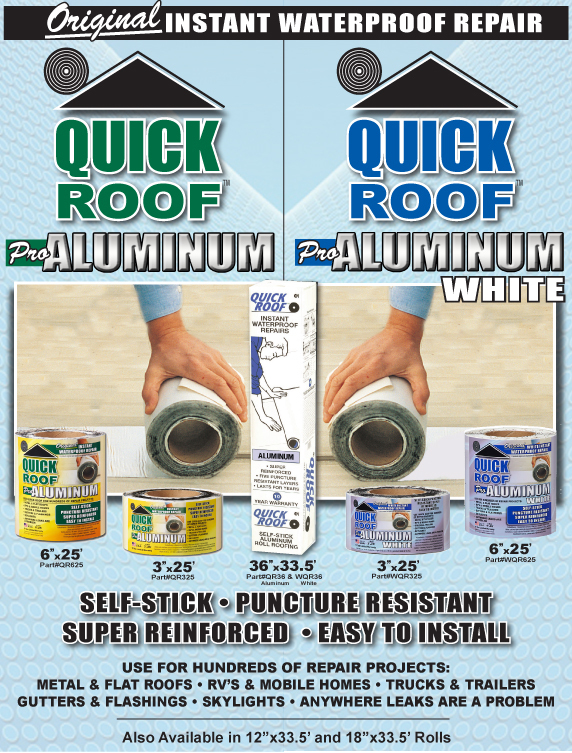 QUICK ROOF is the original aluminum-faced self-adhesive roll roofing and roof repair material. Its patented formula consists of a polymer reinforced aluminum surface and an aggressive rubberized asphalt adhesive. It's UV stable, seals out the elements, and has a ten-year limited warranty. SURFACE PREPARATION — QUICK ROOF will adhere to most construction surfaces including wood, metal, fiberglass, fully cured masonry, and existing smooth built up asphalt roofs. All surfaces receiving Quick Roof must be clean, dry, and structurally sound. Prior to installation, remove all dust, dirt, loose nails and other loose materials. DIRECTIONS FOR USE — Apply Quick Roof when air and substrate temperatures are a minimum of 45 F or warmer. With backing paper attached, unroll Quick Roof and position over area to be repaired. Use a sharp utility knife or scissors to cut to correct size. Remove release paper and press in place. To maximize adhesion, the use of a small hand roller is recommended. On larger repairs, slowly and carefully unroll Quick Roof peeling off release paper and pressing in place as you go. Be sure to eliminate air pockets and keep the roll properly aligned. Quick Roof will adhere to itself. A minimum overlap of two inches is recommended on side seams, and six inches on end seams. If repairing a large sloped area, installation should begin at the low point and proceed up the slope of the roof. PRECAUTIONS AND WARNINGS — Quick Roof is slippery, especially when wet. Use caution when walking or standing on Quick Roof. 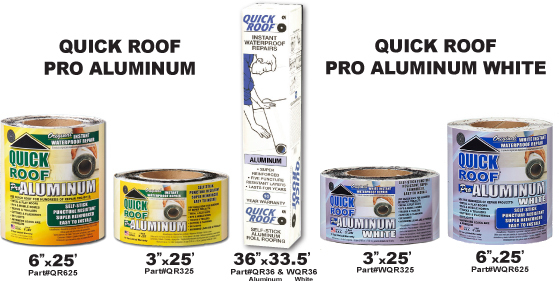 Quick Roof is incompatible with EPDM, TPO, flexible PVC, uncured neoprene, and silicone caulks. If fasteners are removed from Quick Roof, or other tears or holes occur during installation, they can easily be repaired by covering the damaged area with another piece of Quick Roof. Material Thickness ASTM D 5147 45 Mils Nom. LIMITED WARRANTY: Cofair warrants this product to be of merchantable quality when used and/or applied in accordance with instructions hereon. Cofair does not warrant this product for any other purpose or use other than for the general purpose for which it was intended. Liability under this warranty is limited to the replacement of defective product as purchased. THIS LIMITED WARRANTY IS ISSUED IN LIEU OF ALL OTHER EXPRESSED AND IMPLIED WARRANTIES, INCLUDING THE WARRANTY OF FITNESS, AND EXPRESSLY EXCLUDES LIABILITY FOR CONSEQUENTIAL DAMAGES.